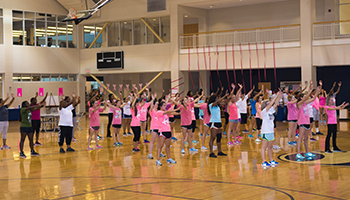 Workout to support a great cause! 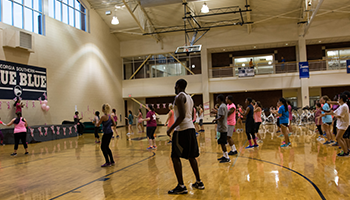 Come work out with Group Fitness to support a good cause! At Pilates for Pink you will get an awesome workout while supporting breast cancer research and awareness. 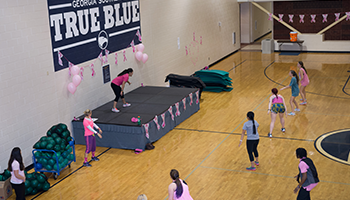 Wear your favorite pink gear and come ready to sweat. Free food, prizes, and giveaways all night! 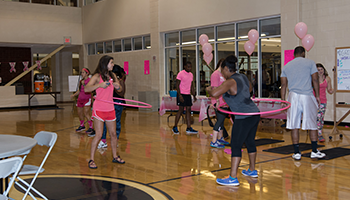 Zumba Party for Pink 6:00 – 6:25 p.m.
Short Circuit and Pedal for Pink 6:30 – 6:55 p.m.
Zumba Party and Pedal for Pink 7:00 – 7:25 p.m.
Pilates for Pink 7:30 – 8:00 p.m.
Dance your way fit! This is an exhilarating and fun class uses Latin and hip hop dancing for a workout that will leave you sweating… and smiling! Working out has never been this much fun! This indoor cycling class will help you reach your fitness goals while having fun and listening to great music! Strengthen and tone your core like never before! This Pilates class incorporates exercises designed to specifically tone your core and deliver optimal muscle strength, flexibility, and endurance! A 25-minute class that is a combination of cardio and resistance training. Instructors will challenge you to strengthen and tone your muscles with a workout that includes calorie burning cardio and muscle toning weightlifting.